Unified communications (UC) has been a continually evolving market for the pastdecade. 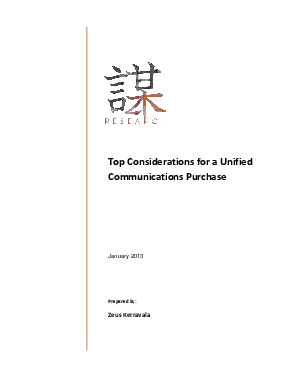 UC was initially centered on voice over IP (VoIP) and unified messaging, but has expanded significantly over the past several years. While VoIP remains a foundational technology, the breadth of UC applications has expanded to include collaborative applications such as video, mobile services, social media and document sharing (see Exhibit 1). Additionally, deployment options have expanded from premise-based solutions to include cloud and virtual options.